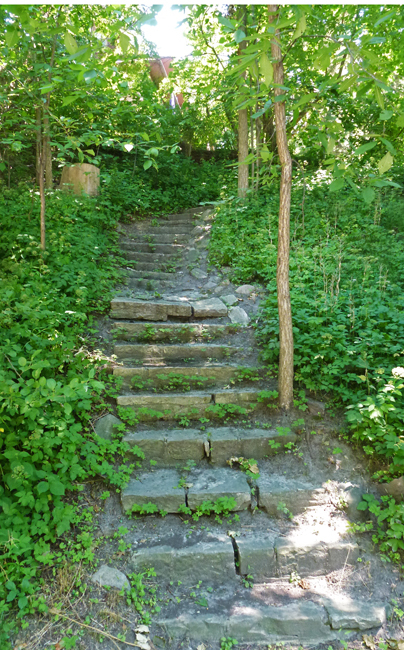 This very rural looking stairway is actually in the middle of the city in the Wychwood Park neighbourhood and leads up to a home worth a few million dollars. This is a privately owned neighbourhhood that has never been taken over by the city which means that the residents are responsible for all road maintenance etc. It is a nice shady place to walk on a hot summer day with a large pond, tennis courts, and lovely arts & crafts homes. I want to say heaven! That song is always a favorite of mine. Love the stairway and photo. Enjoy your day! It looks so lush and green and as you said, a great place for a nice walk. A privately owned neighbourhood... I never thought anything like that was possible in T.O. Sounds like a great place. I'd walk up that staircase, very nice indeed. It's a very nice looking set of stairs. I bet the house worth millions follows the same theme. I'll take it . . .